The two little girls go to the same playgroup we do. Matching blue eyes, matching tufts of blonde hair, and also, every week, matching clothes. Down to the socks. I wish I could say they were idiosyncratic, that this was the only pair I knew with constantly coordinated frocks. But twins with identical wardrobes is a common sight, indeed. As a mother of twins myself, I have an eye for picking same-aged siblings out of a crowd. And when they are dressed alike, as they often are, I’ll admit it is cute. For the parents, perhaps, for the onlookers. What message, however, is it sending the children themselves? You can read the entire post here, at Brain, Child Magazine. Seems so reasonable when you lay out the argument. I’ve always wondered about this. I suppose there’s something positive about belonging to one another and excluding others, but the overall effect may be more negative than we’d like to think with something so cute. 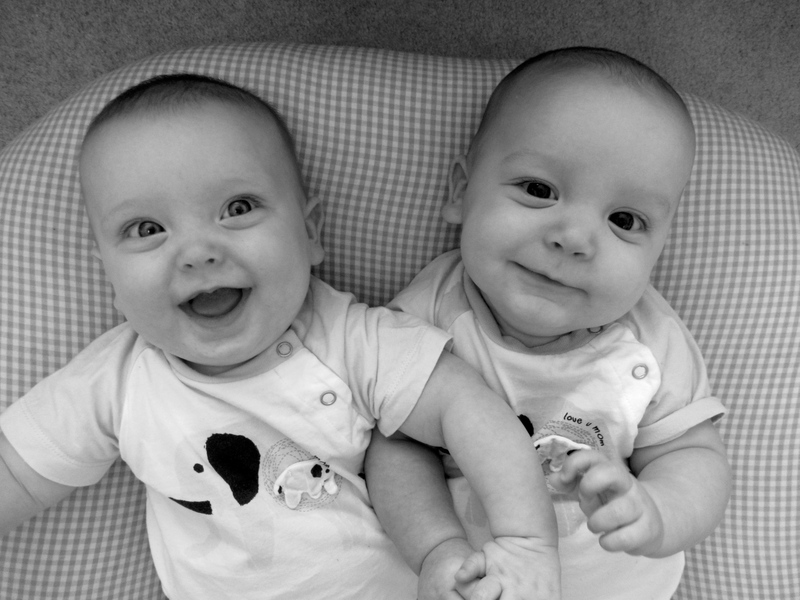 Did I mention anytime how much I love that photo of the twins. Sooooo cute! I have a cousin who dressed his 3 girls all the same when they were little because it made it easier for him to pick them out in a crowd. Never had to remember what any one of them was wearing if they all looked alike. They were all singles. No twins. He was just being neurotic I guess. Interestingly, many parents chimed in on this piece about the false sense of safety dressing children alike can give. Sometimes, it means you are more likely to lose sight of one of your kids because you have mistaken him/her for another of your kids, in the same clothes!